Most people associate tells in poker with live poker games rather than online tournaments. Yet contrary to popular belief, online players can also exhibit certain tells during play, and it is important to be able to detect these signals. What follows are some tips for how to determine a player's tells online, and what to do when you've figured them out. One way to identify a player's tell is to observe the speed with which they make a move. If they make a play immediately (also called an "insta-play"), that may be a sign that a player is confident that they have a good hand. Your goal then will be to break down this confidence and force players to second-guess their decisions. If players "tank," or play slowly, this hesitation may also provide some insight into their current hand. Often, it may be a sign that they have a mediocre hand and are ruminating on how to play it. Tanking is also frequently a sign that a player is working up a bluff, so pay close attention to what a player does after taking a lengthy amount of time to make a decision. It may take at least a few rounds to determine what a player's pacing indicates about his or her hand. 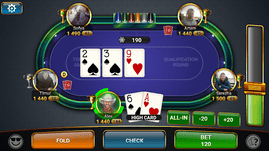 In online poker, you have to play close attention to your opponents' moves and styles, just as you would in a traditional poker game, in order to get a sense of their rhythm and their methods.